Designed and tested predominantly for performance-oriented street use, Brembo Sport brake pads represent the first upgrade level for any braking system. These products have been created for drivers who are looking for a performance increase over stock pads and want to maximize the potential of their car. Brembo Sport EVO 500++ works in a wide range of environments, suitable for everything from daily driving to intermediate track use. 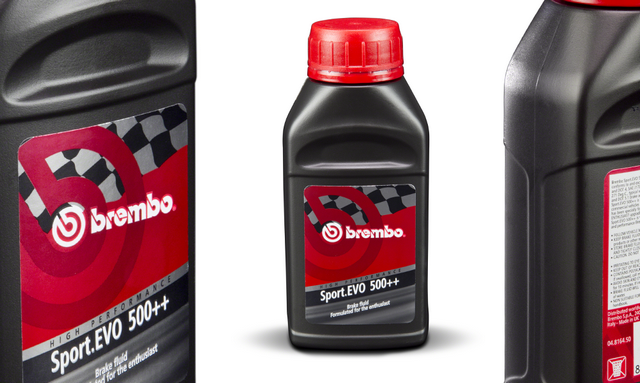 This is a reliable high quality fluid that improves pedal feel and consistent braking performance without the frequent inspection intervals of a full racing brake fluid. Specifications: Size: 250ml, Boiling Point Wet: 168 C / 336 F, Boiling Point Dry: 271 C / 520 F, DOT Rating: DOT3 or DOT4 specifications per US FMVSS, and Mixes safely with other DOT3, DOT4, and DOT 5.1 fluids.